The Pixel 3 Lite smartphone’s latest leak has given away all the details about the rumoured handset. The upcoming alleged offering from Google has already been leaked extensively in the past, and now a hands-on video of the device has surfaced on YouTube, leaving nothing to the imagination. The leak not only describes the Pixel 3 Lite “pre-production sample” unit but reveals all its specifications, including those that were not known until now. The Pixel 3 Lite is tipped to come with the same dual-tone finish and a mint-coloured power button as its elder sibling Pixel 3 and Pixel 3 XL. However, the phone features a plastic body instead of a metal frame and etched glass. The fascia of the device is said to flaunt an 18:9 aspect ratio display with bezels all around. Unlike the regular variants, the Lite variant employs a bottom firing speakers and a 3.5mm headphone jack at the top edge. There will be a USB Type C port at the bottom on the phone. The right spine of the phone flaunts power button, while the left edge gets SIM card slot and volume buttons. 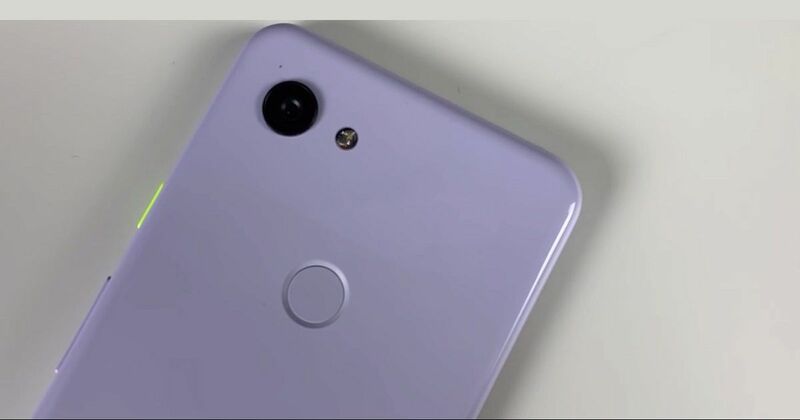 It’s worth mentioning that since the Pixel 3 Lite is still under the pre-production stage and, hence, features a generic logo in place of the ‘G’ signage on the rear. Given the early stage of the device shown below, it’s unlikely that the retail box shown in the YouTube thumbnail is real and is likely to be a mockup. Coming to the specifications, Pixel 3 Lite reportedly sports a 5.56-inch display with full HD+ (1,080 x 2,160p) resolution. The phone rocks Qualcomm’s latest 10nm Snapdragon 670 chipset paired with 4GB of RAM and meagre 32GB internal storage. It remains to be seen if the handset will have a microSD card slot or not. Notably, Pixel lineup doesn’t come with user-expandable storage, but Google gives the users unlimited access to its cloud storage service. In the camera department, the Pixel 3 Lite flaunts the same 12.2-megapixel primary sensor with f/1.8 aperture lens as its flagship models. On the front, it relies on a single 8-megapixel snapper for selfies and video. The video also shared few camera samples, and the YouTuber claims it’s up to the par with expensive Pixel models. The phone boots Android 9 Pie out of the box and is powered by 2,915mAh battery. The only missing piece in the puzzle now is the Pixel 3 Lite’s price and availability. There are reports that the phone will make its debut this year, but Google is yet to confirm. Meanwhile, it has been tipped that Google might introduce a Pixel 3 XL Lite alongside the regular variant, and the XL could come with a bigger display and a slightly better chipset -Snapdragon 710. That’s all we know so far!